This article is regarding the Great Birbala, Kanaklata Barua. Kanaklata Barua was an Indian freedom fighter from Assam, the north-eastern state of India. She was gunned down by the British armed Police along with Mukunda Kakati in front of Gohpur Ploice Station in 20 September1942. She was shot dead while leading a procession bearing the National Flag during the Quit India Movement of 1942 at the age of 17. She was a brave girl and was called Birbala. Kanaklata was born on 22nd December 1924 in the Borangabari village, in Sonitpur district which was then undivided Darrang district of Assam. Her father was Shri Krishna Kanta and her mother was Smt. Karneshwari Barua. Her grandfather Ghana Kanta Barua was a famous hunter in Darrang. When she was she was only five her mother died. Then her father remarried and he also died when she was only thirteen years old. She went to school only upto class three. Then stopped her study to take care of her younger brothers and sisters. She was responsible since her childhood. She was patriotic from her very childhood. She joined Mrityu Bahini, a death squad comprising groups of youth from the Gohpur sub division of Assam. 20th September of 1942 is a golden in the history of 'Quit India Movement'. Like in many other places of India, freedom fighters of Assam also took preparation for successful implementation of this 'Quit India Movement'. This Bahini decided to hoist the Indian national flag at the local police station on 20th September 1942. In the early morning, like the other days, she completed her domestic works and took meal with her younger brother and sisters. She told them mournfully that she might not be able to come back alive and then she went out and joined the procession. She stood at the head of the women volunteer’s line with the national flag in her hand. The volunteers, two in line, male and female began to proceed towards the Gohpur Police Station. The aim of the volunteers was to hoist the Indian national flag at the British dominated police station, following Gandhiji's principle of non-violence. They were joined by many other volunteers at different places on their way to Gohpur and all of them were shouting the slogans, 'British imperialists should go back', 'Freedom is our birth right' etc. Shouting the slogan 'Do or Die' they reached the Thana and made queue before the Thana gate. The police force took their position and did not allow the picketers to enter the compound to hoist the flag. Kanaklata with the national flag in her hand tried to convince the policemen by saying that they came to achieve their noble duty to hoist the national flag at the Thana for the cause of the nation and they would follow Gandhiji's principle of non-violence. They would surely go back after finishing their noble duty. But the police force prevented the volunteers and pointed their guns towards them. Ultimately without any fare in her mind Kanaklata entered the compound by pushing aside a gun in her hand, saying that they could kill their human bodies but not their soul which is made of iron. This immortal speech of Kanaklata gave inspiration to thousands of picketers on that eve of imminent danger. The police force opened fire at the unarmed picketers and Kanaklata was gunned down. Kanaklata died on the spot with the flag on her hand. The flag she was carrying with her was taken up by Mukunda Kakoti who too was gunned down. Both Kanaklata and Kakoti were killed in the police action. Kanaklata was only 17 years old at the time she gave her life for her mathribhumi. In this action lot of volunteers were also injured but this brutality police action could not stop the volunteers from achieving their goal, and ultimately, one Rampati Rajkhowa of Kamdewal hoisted our Indian national flag on the top of the Thana building in that evening. The body of Kanaklata was brought to her home and cremated at her own land. Mukunda Kakty was also cremated on the same night. Kanaklata is no more with us, but the sacrifice of her life for the cause of freedom of our country has remained a great source of insperation for thousands of indian women. India will always remember her as a great Birbala. We all Indian will always feel proud of her. India’s Fast Patrol Vessel ICGS Kanak Lata Barua of the Indian Coast Guard was commissioned in 1997. It was on the name of the great Birbala, Kanaklata. 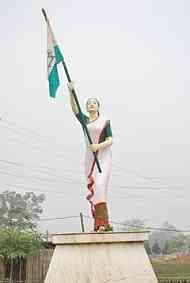 A life size statue of hers was unveiled at Gauripur in 2011.